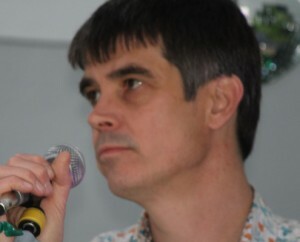 Our host, Geoff Allnutt, aka The Speech Painter, has been a performance poet since 1988. He has performed all over the UK from poetry clubs to music and literature festivals and is the winner of numerous poetry slams (including Glastonbury Festival). His verse play, Walt Disney, Man or Mouse?, premiered at Apples & Snakes in 1994. Between 1995 and 1998 he was a founder-member of poetry’s first pop group, Atomic Lip, together with Patience Agbabi, Steve Tasane, Pink Sly and Joelle Taylor. He staged his first one man show, Beating Time, in 2000 and, in 2003, he was co-host and co-programmer for Pure Poetry at Soho Theatre, a weekly poetry cabaret show placing page poets and performance poets together on the same stage. His film poem, This Time Next Year, was commissioned for Channel 4 in 2004 and he is also a regular support act for chanson singer Philip Jeays. 2011 saw Geoff commissioned to write and perform at a celebration in recognition of the poets and writers Alice and Wilfred Meynells and the centenary of their house purchase in Greatham, Sussex. A poet, musician and a self-proclaimed Paradoxical Dadaist who started performing poetry and music in Cornwall in the late 70s. Moved to London in the early 1980s and performed around various low dives and high poetry venues in London where he was part of the Apples and Snakes collective for a number of years. Also a member of the legendary Ragged Trousered Cabaret. Moved to Hampshire in the mid 90’s and for a while was poet in residence at Write Angle in Petersfield. He presently performs occasionally along the South coast, with the occasional adventures further afield. Steve Tasane is a Performance Poet and Author and describes his performance poetry as loud, funny, in-your-face, and designed for enthusiastic audience participation. He will also be reading from his new book Child I, published by Faber. For the first time, The Haslemere Fringe Festival is hosting a poetry competition. Poetry at the Fringe in the past is usually represented by professional poets performing at the Festival, together with the popular Inter School Poetry Slam on the Sunday afternoon – usually one of the highlights of The Fringe! 2018 sees the bonus of a poetry competition – with prizes of Haslemere Bookshop vouchers – where the winners have an opportunity to have their poetry recited at the Fringe and, unlike many poetry competitions, there is no line limit and no subject header. There is, however, a four-minute recital length. Once again the 2018 Fringe Poetry Slam Competition, pits local senior schools in a head to head battle to win the Haslemere Fringe Festival Poetry Cup. This year we see Midhurst Rother joining Woolmer Hill, Bohunt and Rodborough who have all competed against each other in the past, so this year will the Cup go somewhere new! The poetry, which is written and presented by each competitor is of an outstanding quality and can evoke the audience by being extremely moving, controversial, topical and not least, very funny. Come along and support your local school!